You can decorate your home by hanging the Fauz animal heads. You can use clay animals that is lighter to hand on your walls, thus making your home to look fantastic. Also, you can use paper animal heads for local craft. 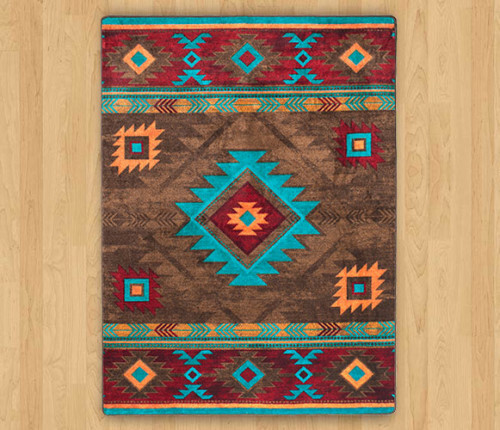 However, you can accessorize your space using arts and crafts items associated with the Hispanic culture and the Native Americans, that symbolize the Southwestern style. You can use fabrics as a decoration tool in your home. Textiles and roughly textured fabrics provide a level of authenticity to any southern inspired room. You can scatter them throughout the space using them on area rugs, tapestries, throw pillows and draperies. Leather furniture is gorgeous in a home decoration, but it's costly to afford. But you can add some small-scale decoration that contains art pieces and will make your home look amazing without leather furniture. You can use feathers with all colors or the colors of your taste to decorate your home. For example, you can hang them on the ceiling or arrange them in a pot. Therefore making your home look excellent and keep the house fresh. Introduce natural Southwestern colors to your rooms. The bold, bright colors of the Southwestern style are drawn from the land. You can use cobalt and turquoise of the sky, orange and yellow that are found in the desert plants, beiges and browns scattered on the desert floor and the sage greens. Also, you can use Taos blue, a mixture of violet and sky blue and a standard. Growing cacti in your home may seem to be a challenge. But you can have a Southwestern decor in your home by making cacti since they are constant on the dusty desert horizon. Keep them clean and put them in your display. Assume using the cacti garden desktop succulent plant in the planter; it can be very good looking. Metallic details are one of the Southwestern looks. For example, you can use copper, think of using spurs on boots, horse’s bridle or the buckles on belts. You can mix the staple with any modern trend to make it look gorgeous. Make your floor and wall amazing by designing them with woven rugs and the tapestries. They appeal well in Southwestern settings. You can décor you floor by drawing it with a carpet splashed with Aztec symbols. With the walls, weave them using your own tapestry. Therefore, bringing in eye-catch of everyone that enters your house. An area rug is a great solution for many of your design and flooring needs. The benefits of using an area rug within your home are numerous. The decision to add it to your room is a great choice. You can create a beautiful stylish room with the use of an rugs. You can add a statement to your room with a beautiful area-rug. Below are some great reasons as to why it is a good addition to your home. colors together. Your area-rug is a great way to introduce color and tie your existing colors together. A new rug can completely transform your space. • A large room or awkward layout can make it difficult to assert your space. This can help you differentiate between spaces. You can use it to divide a large room into certain areas for entertaining purposes. It will be easy to find a rug for your space because of the vast colors, shapes, and sizes available. large variety of rugs from the comfort of your home. • Outdoor spaces are a great place to entertain family and friends. Outdoor areas are more important than ever before. Injecting personality and style into your outdoor space can be fun and easy with the use of the rug. An outdoor carpet can completely transform your space. Your space will be much more inviting and stylish with an outdoor rug. There are many styles of wool rugs you can choose from. Oriental, Persian, Southwestern, contemporary, and more styles can be found made from wool. They can be found in many sizes as well as many different colors and patterns, which make choosing a rug easier. Woolen area rugs can be found in many stores across the world. They can be found in small outdoor markets and large home furnishing stores. They can also be purchased online. If you do choose to purchase an area rug online make sure the online store has a return policy if the rug does not work once you place it in your room. When buying rugs you will want to test for colorfastness. To do this you can rub a damp cloth across the rug. If color bleeds onto the cloth you should keep shopping. A colorfast rug will last long and be less likely to fade.Remember, the rug you choose will speak volumes about your design style. Don't just throw any old rug down. Spend time deciding what type you want for your room. What size, style, color, and texture will work best for you? What do I want it for; what benefits am I looking for? Only after answering these questions will you be able to choose the perfect rug. you can do with an area rugs so start shopping for yours today! As we grow up, we begin to notice details of buildings, houses, etc. The decor of each of these places comes to put life and meaning into them. Traveling through Europe, I visited Spain and Italy. Each of these countries are full of history and it is seen through the decor that is used by the citizens of these countries. That same year, a couple of months later, my family and I were moving from a house to an apartment where we took a kind of Spanish, European style. Just as the house we stayed in, the apartment was left completely white and floors that were marble tiles. Just as in the towns in Spain that all buildings are white, they all come to life with the bright colors and prints chosen for chairs, bed sheets, and even things to up on a wall. This is exactly what we did as well. There were some paintings from the old house and a modern office chair on sale that had bright colors that made everything vivid. Apart from the paintings, there were some pillows of different patterns that went on the white furniture. Through these many things it made the house vivid and full of life. Decor is very important because it makes one comfortable and happy to get to their home. It makes each person to analyze why the owner would choose certain decorations and colors that maybe others wouldn’t. Decor brings a person’s personality into their home and possibly their history will be integrated into their home decorations. Decor matters to catch people's attention, to make them feel astonished. To take someone's breath away with just a glance and have them mesmerized. I believe decor matters greatly especially to remember the past life and how their culture was. It’s a way to express something that may have happened in the past or how the past was. Like to show a story behind the decor it’s a form of art. Not only that the way the decor comes together and the way you put it together it makes a difference in the atmosphere of the place. Like in my daily life the way someone decors is how they present themselves. I’m very much of being bright and being very cool and relaxing atmosphere. It’s a way you express yourself and have the liberty of doing so what you like and your taste. It’s a time to be creative and let your mind flow and gather your talent all in one. That’s why we should look deep into the decor that was made years ago, ancient decor to see how magnificent and detailed they were. Have a glimpse of the past to be able to appreciate their talent. It’s like they tell a story behind every art piece they make, very detailed and talented. It matters over all if we didn’t have it the world would be so dull, so lifeless no meaning behind anything whatsoever. It’s a way of telling the past life and how much it has evolved to what it is now. There’s so much more than just a small decor it’s a lifestyle. There’s also decor that shows how it can defeat gravity and show a way how physics can come into play. There’s so many astonishing pieces that don’t get appreciated enough. It’s more than just a piece of art it’s our past, present and future.